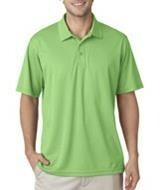 Embroidered UltraClub Men's Cool & Dry Mesh Pique Polo Shirt. 100% polyester mesh pique, 4.4 oz. moisture wicking UV Protection. Three button placket with color matching buttons. Tagless. Includes up to 7000 stitches of embroidery in one location. See Options for additional charges.